Product prices and availability are accurate as of 2019-04-21 19:51:18 UTC and are subject to change. Any price and availability information displayed on http://www.amazon.com/ at the time of purchase will apply to the purchase of this product. View more information and reviews on the Spalding 68395R here. 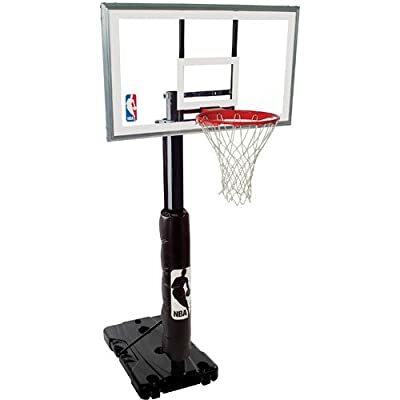 The Spalding(r) 68395R 54-in Polycarbonate Portable Basketball System includes a sturdy, solid steel Arena Slam rim, an all-weather net, and an aluminum-framed polycarbonate backboard. It adjusts quickly from 7.5 to 10-ft with a hassle-free Screw Jack lift system. The 40-gal base fulls of water or sand for stability. View YouTube Video "Spalding Pro Style 54 Inch Acrylic Portable Basketball Hoop System - Product Review Video"
Bought this goal for our sons 16th birthday and my husband and son just love the goal. Great looking but more importantly very sturdy with large backboard. The DIRECTIONS are not great! Especially when it comes to putting on the crank mechanism for the height adjustment. BE SURE you put the top bolt through both holes of both the metal and plastic tubes. It does not state that and we originally put it only through the plastic tube, because of how the picture looked, and obviously, it couldn't work. We ended up looking at some of the reviews that ended up giving us a clue into our problem. Also, there are no directions to attaching the backboard guards. A drill bit is included in the small package of screws so you have to drill your own holes in order to screw in the guards into the goal. HIGHLY RECOMMEND just wish the directions were better. Took us about 3 1/2 hours to put together with my husband and 16 year old son. Purchased item from this web site because the pricing was about $200 cheaper than other web site, plus free shipping was offered. Received item in a damaged box that had been re taped together. Missing several pieces of hardware for assembly of goal. Contacted the manufacturer immediately and they shipped out all the necessary hardware thru FedEx which only took 2 days to arrive free of charge. Will be setting up goal this weekend! I would not purchase from competitive edge again. Also noticed that a third party was involved in transaction. From Competitive Edge: The item here is shipped directly from Spalding, located in Alexander City, Alabama. We are based in Utah. The item ships via FedEx. If an item arrives with tape on it, as this review describes, the tape has been added by FedEx to help secure the contents if FedEx determines the package is getting beat up too badly in transit. If something does arrive damaged or is missing parts, please let us know as we will have Spalding reship parts at no cost to the customer. The parties involved in this process are as follows: the customer orders from Competitive Edge, who ships the item from Spalding via FedEx. No other party is involved. Great price and good shipping. You will need at least 2 people to put it together. Had some challenges w/ pieces and putting it together. 1 piece was missing but we were able manage. Overall very good. Overall good quality well built goal. However,as others have noted directions could use work, nothing major and build went fine. Until the last step. mounting Hoop to board. Missing plate ... Called a week ago they said it would be shipped out air freight. One week later still no parts ... ... ... . Kids not happy! No issue with product. all of my three youth like this basketball hoop very much. First, I will highly recommend your internet company and fast shipping. but I found , you have to check and label you parts before you assembly it, it is missing one part, when you set the ring. also, for the pole connection part is most difficult one, we need extra help. also when you raise up the whole hoop, should be very careful when we have slope sidewalk ... overall, it is a very pleasant birthday gift for my son, and appreciate your price and free shipping !!! Great Price and Delivery. I was skeptical because of price and the web site did not seem to have the feel and look of a well established company. However, EVERYTHING else exceeded my expectations. GREAT . FAST SHIPPING. GREAT PRICE.!!! This is a great basketball system. It does take patience and assistance to assemble. Purchased for my sons birthday,he loved it. Woke me up the next morning before the sun was out to shoot hoops. Be sure to account for all parts prior to assembling. We were missing one part (not major). Called Spalding customer service and they shipped part out quickly. Bought this for my son, took some time for my husband to put it together with my help but it is a great basketball net for the money and I was skeptical ordering from this site because it was at least $100 cheaper than all other sites but it was perfect and the shipping was free!!! VERY GOOD GOAL ASSEMBLY FOR THE PRICE. DECK MOUNTING POINTS COULD BE A LITTLE STURDIER. MINOR MOVEMENT SIDE-TO-SIDE. Awesome backboard system and was easy to assemble. With so many selections, with great low price, free shipping is a dealmaker that attracts me to buy at this site. THIS UNIT IS GREAT. THE ONLY ISSUE IS THAT THE ASSEMBLY INSTRUCTIONS COULD BE BETTER. IT TOOK MY SON AND I OVER 2 HOURS TO ASSEMBLE. VERY HIGH QUALITY FOR THE PRICE. Selection is huge, price seems unbeatable, free shipping is a dealmaker that attracts to site. I spent some time researching portable and adjustable basketball hoop systems. This was the best I could find at a very reasonable price. I was amazed how everything fit in such a small box. I put it all together in just a few hours. I would recommend this system to anyone. assembly is a bit tough especially the post which is difficult for two reasons: 1st three sections are not marked well so that proper alignment can be assured, 2nd it is impossible to tell when you have "bounced" the sections together-no benchmark to tell if sections have been "bounced" enough. finally we are missing a vital part for attaching the rim to the backboard. Spading is mailing one but it wont be here for 4-5 days which is disappointing for the kids who are anxious to get playing with this. I purchased one of these basketball systems over a year ago and loved it so much decided to buy another and one and make a small court in my driveway. I did receive a damaged backboard but a new one was shipped out quickly. Bought this for my 12 year old grandson and was told that is a sturdy product. The shipping from Competitive Edge Products was quick. The only complaint is that not all the bolts/screws were in the box. $5.00 and a couple of trips to the hardware store was needed. the price was a hundred dollars cheaper than anywhere else and no shipping. Ordering was seamless and or basketball goal arrived in a matter of days. Unlike other reviews that we read on the difficulty of assembly. This product was a breeze to assemble all parts and instructions were included. Very happy would recommend product and web site. The prices were very reasonable and the internet site was easy to use and navigate. What a great site.